Our concrete repair plan includes the controlled lift of individual slabs of concrete. We achieve a precise result by applying expansive polymer foam just beneath the surface of the slab. This process eliminates the failing condition as well as seals and stabilizes all defective joints and sources of water penetration from further erosion. The variety of soils and substrates across the Front Range are often the root of the problem. Liftech’s concrete repair system treats the soils and addresses the water and erosion issues. The average life cycle of concrete is extended at a fraction of the cost of replacement. Until recently, mudjacking has been the method more commonly used for lifting fallen concrete, and is still a widely acceptable form of restoration. 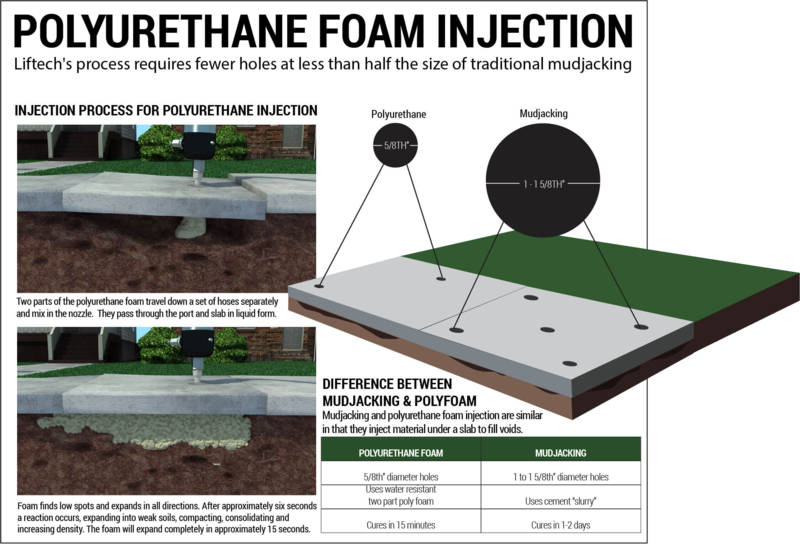 Mudjacking and polyurethane achieve similar results, however, the process by which those results are achieved and the extended performance of the two products are completely different. LONG LASTING! Polyurethane cures as a solid, impermeable structure which adheres to the concrete and is not susceptible to fracture or failure. SOIL STABILIZATION! Polyurethane is injected as a liquid and reacts within the loosely, uncompacted soils to solidify and stabilize those soils. LESS INVASIVE! Liftech uses controlled injections in penny-size holes to raise your concrete quickly and effectively. LIGHTWEIGHT! Polyurethane weighs about two pounds per cubic ft.
IT’S FAST! Polyurethane cures within minutes, with your concrete ready to use again once we leave the job! DEFEND AGAINST MOTHER NATURE SAFELY! Our environmentally friendly solution creates a barrier to moisture, chemicals, insects, rodents and erosion. 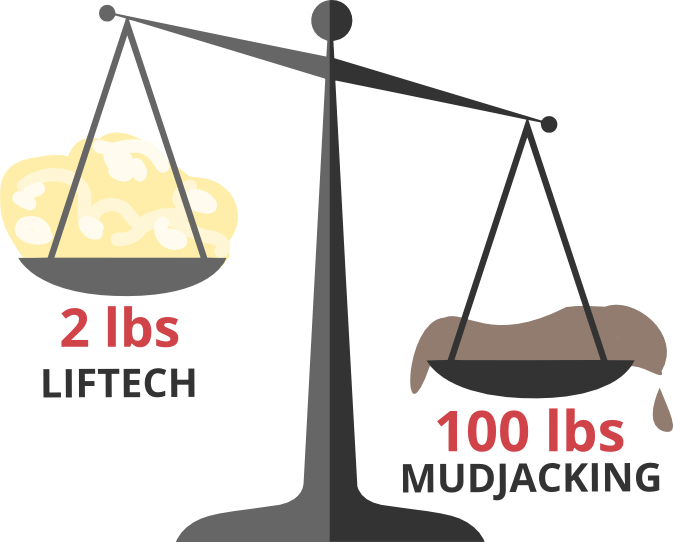 Mudjacking uses a mixture of sand and water infused with a small amount of Portland cement, which helps the material solidify. The sand and water mixture is pumped through 1-5/8″ holes in the concrete using hydraulic pressure to lift the sunken concrete. This mixture is considered a structural fill and is very heavy, weighing an average of 100-110 lbs. per cubic foot of material. Polyurethane concrete raising consists of an environmentally safe liquid polymer foam that is injected through penny-size holes in the concrete and into the loose, unstable soils below. Through a chemical reaction, the high density foam expands to stabilize the loose soils and lift the fallen concrete. After approximately 15 minutes, the polyurethane material is fully cured and ready to return to service. The polyurethane only weighs about 2 pounds per cubic foot of material. Polyurethane foam is an inert, non-toxic, environmentally safe material. It is impervious to moisture or decay, ensuring that over time, it will not only be environmentally friendly, but your concrete repair will last a lifetime. Liftech’s polyurethane system utilizes a much smaller, 5/8″ hole (about the size of a penny). Following the repair those holes are filled with a cementious grout to match the surrounding concrete.